A huge thank you to the Trelix Charitable Trust for their £1,000 donation! Very much appreciated! 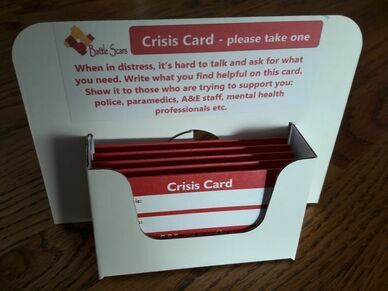 Our crisis card, stand and poster are now available to order by any UK organisation and service (minimum 10). Individual cards are only available to our service users via our groups. If you're out of Leeds and only want one card, please ask a professional to place an order. If you are based in Ireland please contact us (we may be able to provide certain organisations and services with them if mainly working on mental health). The card needs to be filled in when calm and can be presented to A&E staff, police, paramedics, crisis services staff, mental health professionals etc. 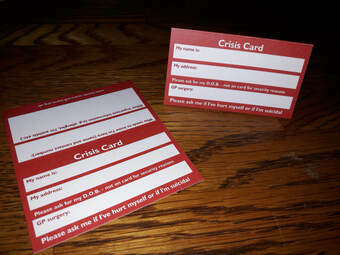 Our crisis card is now available to order by all Leeds organisations and services (including schools) and to all our service users via our groups. The card needs to be filled in when calm and can be presented to A&E staff, police, paramedics etc. and will be considered by the Leeds Crisis team (read it out to them) and ALPS (Acute Liaison Psychiatric Service). This is the trial run which is why we can only send it out to organisations in Leeds but we're hoping to make the cards available nationally in the near future. Many thanks to the Leeds Jewish Welfare Board staff for raising £100 for us during mental health awareness week! Thank you Leodis Pagan Circle for all the hard work you put in to raise this amount for us! We'll make full use of every penny to reflect your efforts! Thank you to the Blakemore Foundation for the £50 donation. It'll come in very handy in covering volunteer and other expenses for the 13 events we have coming up over the next couple of months. Awarded £10,000 by the Big Lottery Fund - Awards For All for our Volunteer Development Programme. If you're interested in volunteering with us please click here. Fantastic self-harm conference yesterday in Dublin. Thanks Pieta House, Preventing Suicide and Self Harm and St. Patrick's Mental Health Services for organising it and especially for inviting me. Thank you for welcoming me, attending my workshops and even inviting me to join you on the end of the day panel! A special thanks to Cat Hughes for being very aware of my mental needs and looking after me. Also a big thank you to the 250 people who attended. It's great to see so many people wanting to learn and help. Battle Scars is now a registered charity!